Choosing a fireplace for your home requires consideration of a number of factors including the type of fuel you will use. Do you enjoy the crackling and snapping sound and smell of a wood fire? The convenience of enjoying your natural gas fireplace at a “flip of a switch”? Perhaps you rely on propane to heat your home. Whether it be preference or necessity, your fuel source is a key factor in your purchase decision. Wood, natural gas, and propane are by far the most common fuel sources of our customers. 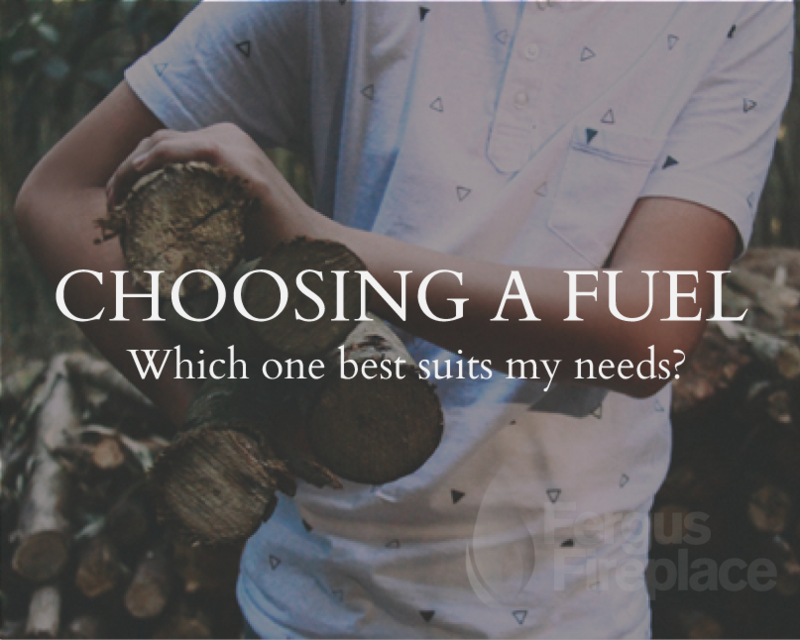 Each fuel has its pros and cons, and in most cases, we find that our customers have all but decided on what they want to use when they come and see us. Let’s consider your options for fuel, as well as the implications of your fuel choice on the purchase and installation of your fireplace, insert or free standing stove. Some people love the sight, sound and smell of a wood fire. They enjoy sourcing out their wood for the season, have a spot to store it, and enjoy bringing the wood indoors and building a masterpiece. After a long day at work, coming home to the warmth and beauty of your gas- fueled fireplace or stove signals the start of a relaxing evening. Your programmed thermostat will have done all the work. In some areas, propane or wood are the only available options. If a reliable, affordable supply of dry wood isn’t easily arranged, or if you don’t want to source, buy and store your wood, than propane is the name of the game. At the risk of stating the obvious, both wood-burning and gas-burning units require venting to the outdoors. Word burning units (fireplaces, fireplace inserts or free standing stoves) require an existing or new chimney or other flue system built in your home. If you plan to use an existing chimney, an initial consultation by one of Fergus Fireplaces WETT certified staff will determine if it is safe to use, and if not, what modifications or repairs could be made. If you intend to place a wood burning unit in a specific area of your home, our staff can suggest a variety of models and venting options which will meet your heating needs, décor and budget as well as comply with building codes and other safety requirements. Again, our trained and experienced staff will guide you through this process. Fergus Fireplace’s employees are fully WETT certified, ensuring a professional and safe installation of your wood burning fireplace, inserts or free-standing stove. If you are purchasing a natural gas or propane fireplace, insert or free-standing stove you must consider the location of any existing natural gas or propane lines in your home, or your ability to install new lines to the area of the installation. Again, our “licensed natural gas” staff can provide expert advice on your options. With so many considerations to take into account, and so many options available, our experienced staff are here to help you make the right decision.